Five of our favourite final masterpieces from opera’s greatest composers. Mozart’s final years were hobbled by debt, but he certainly wasn’t short of work. The premieres of his last two operas came almost on top of one another, La clemenza di Tito on 6 September 1791 and Die Zauberflöte a few weeks later on the 30th. 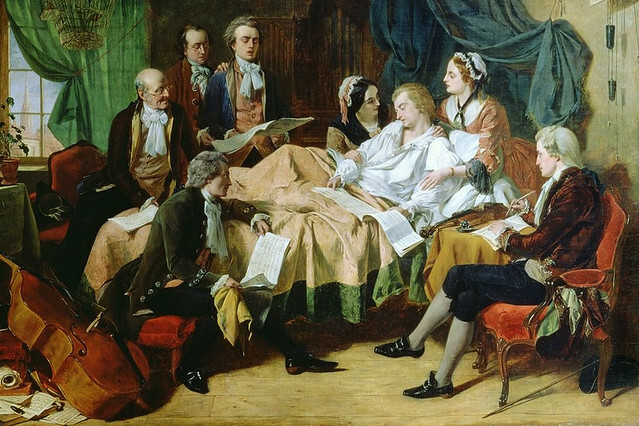 Mozart had probably mostly finished Die Zauberflöte in July, and put it to one side as he speedily wrote Tito in time for the new emperor’s coronation. So Die Zauberflöte is perhaps only nominally a final opera – and yet its bewitching (if sometimes befuddling) story and achingly beautiful music have made Die Zauberflöte one of Mozart’s best-loved operas. Final opera or not, it’s an enchanting showcase of the composer’s genius. Rossini was 32 when he moved to Paris in 1824. Here he wrote the sophisticated occasion piece Il viaggio a Reims to celebrate the coronation of the French king Charles X, adapted two of his Neapolitan operas for French audiences, and wrote two original works for the Paris Opéra: the comic Le Comte Ory in 1828, and the masterful Guillaume Tell in 1829. Today we see Guillaume Tell as the summit of Rossini’s career – a work of genius that fused French and Italian traditions in an innovative and highly idiosyncratic way, which not only anticipated the development of the hugely popular French grand opera but would also influence composers as diverse as Wagner and Offenbach. Rossini seems to have felt the same: he never composed another opera after Guillaume Tell. Bizet’s biography reads like a catalogue of missed opportunities. His musical gifts were evident from an early age, but he spent much of his adult life scraping a living as a transcriber and rehearsal pianist. He abandoned many operatic projects, and the handful that did come to fruition rarely found success. Carmen received more performances during Bizet’s lifetime than any of his other works – but by his tragically early death on the evening of the 33rd performance on 3 June 1875, the opera was still deemed no more than a moderate succès de scandale. Three months later a new production in Vienna would launch Carmen on its way to becoming one of the most popular operas ever written. Wagner began work on his final opera as early as 1845, nearly forty years before its eventual premiere. The intervening years saw Wagner fundamentally alter the musical landscape, along the way gaining acolytes and raising hackles in equal measure. He also realized a long-cherished ambition to build an opera house specifically devoted to his own works, in Bayreuth, albeit at ruinous expense. Parsifal, a Bühnenweihfestspiel (‘stage-consecrating festival play’), was written specifically for the new theatre, and Wagner intended that it be performed only there for at least the next thirty years. He didn’t live to see his embargo broken after only a few years, as the world clamoured to hear this enigmatic, awe-inspiring final statement from an operatic master. Verdi wrote his first comic opera, Un giorno di regno, in 1840. It was an unmitigated disaster, and almost led the young composer to renounce music altogether. Twenty-five operas and 53 years later, he decided to give it another go and produced Falstaff, arguably opera’s greatest comedy. Buoyed by the success of Otello, which Verdi wrote in collaboration with librettist Arrigo Boito, Verdi followed Boito’s suggestion to adapt The Merry Wives of Windsor. He and Boito worked together to craft a vivid portrait of Shakespeare’s scandalous, lecherous, life-loving knight, in a work of glorious vitality – an ebullient final testament from the 80-year-old composer. Guillaume Tell runs until 17 July 2015. Tickets are still available. Falstaff runs until 18 July 2015. Tickets are still available. Carmen runs 19 October–30 November 2015. Tickets go on general sale on 14 July 2015.